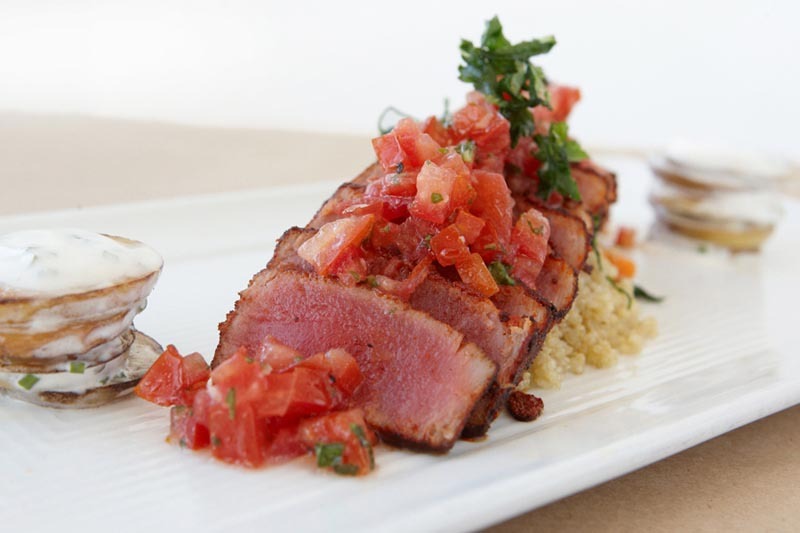 San Diego— The 2011 gastronomy season kicks off on January 16th and lasts through the 21st. It is the seventh annual San Diego Restaurant Week and is one of my favorite hometown events. This year, over 180 restaurants and their chefs will show off three course, fixed price menus in the $20, $30 and $40 categories. Originally launched to spotlight San Diego as a dining destination, it has grown into a twice a year occurrence for food lovers. It’s a great way to sample signature dishes at bargain prices, try new places or revisit old favorites. Last September’s Restaurant Week introduced me to three spots. A complete list of participants and menus is available on the San Diego Restaurant Week website. Note: some of the restaurants will extend the promotion beyond January 21st. Advanced reservations are advised. The Kensington Grill was a real find in the $30 category. Its pleasant design is the first thing you notice upon entering. The menu for the evening was eclectic and we had a tough time deciding what to order. My wife and I shared two appetizers: charred asparagus and poached egg with pancetta vinaigrette, and the chopped fresh vegetables with champagne dressing. Both were outstanding and a hint of what was to come. Our entrées were the grilled pork chop and the blackened ahi. Each plate featured interesting side dishes including quinoa, Yukon medallions and butternut squash farro. After much thought, we selected our desserts: key lime crème brulee and the house specialty, banana bread pudding. The service was first rate and the food and the presentation excellent. There are daily food specials, as well as drink promotions, corkage waivers and a happy hour. The Kensington Grill is classy yet comfortable. They also operate the Cucina Urbana and Urban Kitchen Catering. For reservations call 1-619-281-4014 or go online for more information. Put it on your “A” list. The Whisknladle, a La Jolla bistro, was on the $40 list. For my starter, I chose the cutting board which included a variety of cured meats and cheeses, freshly made mustards, spreads and pickled veggies. My wife ordered the mussels and fries. They were so good that she didn’t want to share. Need I say more? For the second course she chose the Alaskan halibut. My pick was their signature dish, the Niman Ranch burger with cheese, bacon, and caramelized onions topped with a fried egg. My turn not to share (turnabout is fair play). All of the dessert choices were irresistible, but we finally ordered the chocolate malted crunch bar and artisan cheese plate. Nice touches included their freshly baked bread and flavored butter. They have a year-round patio as well as indoor dining. As one would expect, the presentation has a sophisticated flair and the staff is well trained and welcoming. This restaurant should be on your “must go” list. For reservations, call 1-858-551-7575 or go online. They also operate the Prepkitchen in La Jolla .